The district of Ueno in northeast Tokyo is famous for a number of reasons. 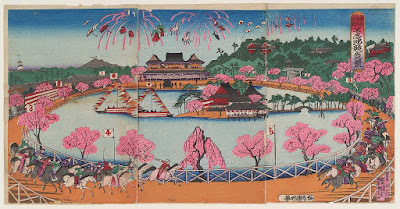 Not far from Asakusa, the home of the 18th century Yoshiwara entertainment district, today it is famous for the sakura trees in spring when the hordes will descende after work hours to drink beer and party together. It's also the home to the capital's largest zoo boasting pandas and where a friend of mine once green-screened a giraffe. And it also has a pond. And Shinobazu Pond has a history. If you look at it's shape it somewhat hints at what it may be. Although today the Ueno district would appear to be inland, it's actually an ancient reed bed, overspill from the tidal flows of the Pacific Ocean as it hugged the coast line of Tokyo Bay. But the natural shape of the swamp and a 2,000 meter circumference provided an opportunity for a popular sport in the new Meiji Era. Enterprising entrepreneurs of the day decided to build a horse track around its permitter in 1884 and enjoyed a day at the races for the next several years. The Emperor actually attended the opening event but horse races are expensive and eventually it fell into disuse and closed by 1892. And today it is quite a pleasant lily pond; though a filtration system keeps it a little cleaner than it was in the days when it would bear witness to the Sport of Kings. And that is why it's the shape it is.